Previously operated by: Associated Prudential Theaters Inc., Bow-Tie Cinemas, Clearview Cinemas, Skouras Theatres, United Artists Theater Circuit Inc. The Palace Theatre opened as a vaudeville house in the early-1920’s, by the Metropolitan Playhouses chain. The theatre was designed in Spanish Baroque style, and eventually switched over to an all-film policy. United Artists took over when they bought the building (and many others) from Associated Prudential Theatres sometime in the 1960’s. The theatre featured a narrow lobby and wide auditorium with a balcony. One of the original Clearview Cinemas, the theatre was divided into a five-plex on May 19, 1989, with two auditoriums in the balcony (which was extended out toward the stage), two under the balcony, and one in front. The front auditorium was designed in ‘reverse’, meaning the projection booth was built onto the stage and the seats are facing out into the original auditorium, with some seats still on the stage-a mini ‘balcony’, sort of! In June 2013, Bow-Tie Cinemas too over as it took most of Clearview locations. Bow-Tie moved out on April 2, 2018 and the theatre now operates iunder independent management. Listed as a 2 screen independent theatre in the 1991 International Motion Picture Almanac. I’ve been there many times when it was still one screen. Nothing spectatular, but great fun! 2 occasions stand out; the all-day Planet of the Apes marathon with all 5 films. I walked in near the end of Beneath, and stayed for the other 3 films. Those kids were screaming so loud during Conquest, it gave me a huge headache. The overall quality of Battle did'nt help, either! I also went to see The Song Remains The Same, the Led Zeppelin concert film there. The film starts, but the sound is a little low, so the kids start to yell “Turn it up!” The manager refuses. The kids are screaming “Turn it up!!”. Still the manager refuses. These metal-heads want to stick their heads in the speakers and get their eardrums shedded, pronto. The manager is leaving these hoods no other choice, they start stomping on the seats, breaking them and throwing them at the screen, or at each other. By the time the film is over, about 10 seats are broken, the screen has a hole in it, and one young man has taken it upon himself to urinate on the wall!! Incredible! All because the sound was too low. Gotta love those fine Bergenfield youths. I went to this theatre (The Palace) also known then as Pops Palace, as a kid in late 40’s and into early 50’s. Sat. Mat. kiddie shows. 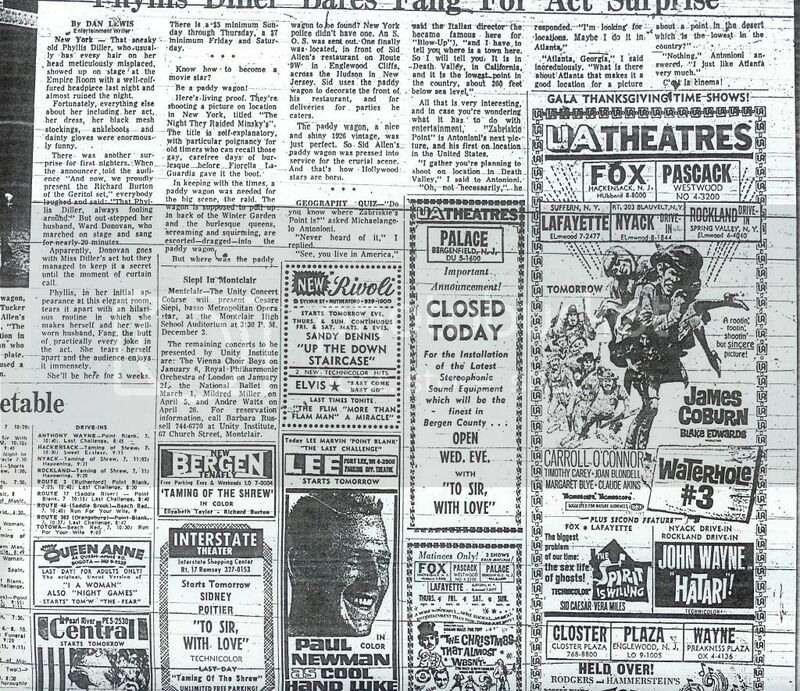 The regular attraction was always a double feature and if one or both of the regular films were “kid” appropriate then they were shown with 10 cartoons and an episode of a serial, Batman, Superman, Captain Video etc. Often one or both of the regular attractions were not shown and westerns, Huntz Hall comedies, Abbott and Costello comedies, etc. were substituted. The bookings then were from Wed. to Sat. and then another show from Sun. to Tues. I would often go back to the movies on Sun afternoon. There was no kid show on Sun, just the regular 2 features. The manager then was George Hollman. Mid 50’s I became an usher at the Fox Theatre in Hackensack and also Assistant Manager there and also at the Englewood Theatre in Englewood. Late 50’s I became Assistant Manager at this Palace Theatre along with Manager Ernest Mezey. Mon. and Tues. nights were dish nights to attract lady patrons. Along with your ticket you got a free plate or cup, etc each week a different item until you got the whole set, eventually. I was Assistant at the Palace during such films as Mary Poppins, West Side Story, Gypsy, South Pacific and many many other classics. Many, many memories. As of April 2, Bergenfield is no longer part of the Bow Tie chain of theatres. This theatre is no longer listed on Bow Tie’s website. It appears they may have gone independent. The marquee says all admissions are $5.00 A new website for the theatre has not been established.